The personality of the village retains the historic charm as many of the original buildings are still being used. A number of interesting buildings remain from Cambria’s early days, including the Old Santa Rosa Church and the Santa Rosa School. From the Cambria Historical Museum to the Historical Landmark Nit Wit Ridge, Cambria's eclectic history is on full display. The best way to experience Cambria's history is to walk around the East Village where most of the original buildings still stand, many repurposed into shops, restaurants, and galleries. Often described as quaint and picturesque, the village of Cambria reflects a rich California history and a certain flair for the artistic. The official Historic Walking Tour will provide all the details about these original buildings and the ancestry of the inhabitants, many descendants never left this bucolic countryside, so don't be surprised if some locals have familiar names! From the center of town your visit should start with the Cambria Historical Museum located in the Guthrie-Bianchini House, a restored original that now serves as our museum. The walking tour and historical plaques let you set your own pace as you explore the village and meet the locals who are now using these very special buildings for their businesses. The unexpected delights in Cambria are vast and a day is well spent exploring it by foot. It is an easy walk and there are plenty of places to stop and soak it all in. Cambria has some landmarks that define the unique character of this coastal village and a few of them are now restaurants! In the East Village, the Old Stone Station was once a gas station and was hand-built by the owner to reflect the original look and feel of the station. In the center of town, the Black Cat Bistro is a converted home that now is an intimate upscale dining establishment. In the East Village, the Sow's Ear is another home conversion that still serves a home-style comfort food in a cozy setting. Indigo Moon and Robins restaurants also were once private homes. And Linn's restaurant on Main Street was once a bank. 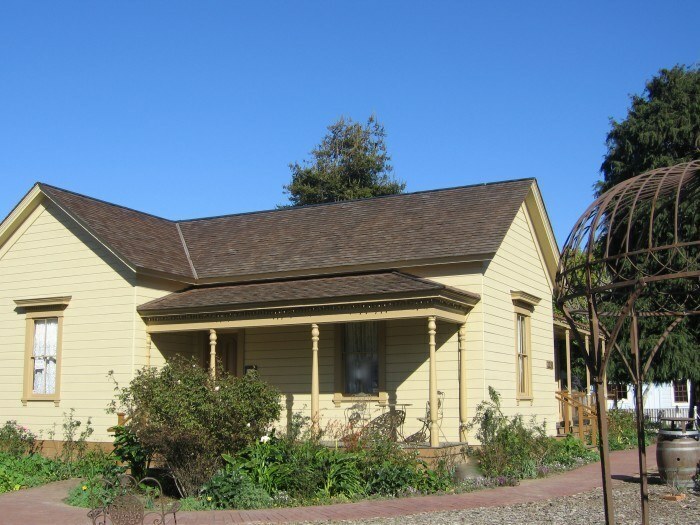 You can explore the Historic Walking Tour and visit some of Cambria's oldest landmarks. The Cambria Historical Society maintains a Paul Squibb collection and the recollections of many other Cambrians — priceless artifacts that give us a sense of place and provide a source of pride for our community. They impart the lessons of America's heritage and values and inspire us with the tenacity and energy of the early pioneers. They give us reason to cherish the homegrown flavor of our town and give Cambria its distinctive personality. The original Yankee settlement which eventually became Cambria was initially located near Leffingwell Cove, where there was a wharf for some years. Eventually, the village of Cambria as we know it, took shape in the 1860s. It is thought that the village got the name through the influence of a surveyor from Cambria County, Pennsylvania. But to this day the pronunciation is a hotly contested topic with even longtime locals in disagreement. We are just happy they ended up calling it Cambria instead of Slabtown, one of the original names. The engineering feat that was highway one made this area more accessible and created one of the world's most favorite driving roads.